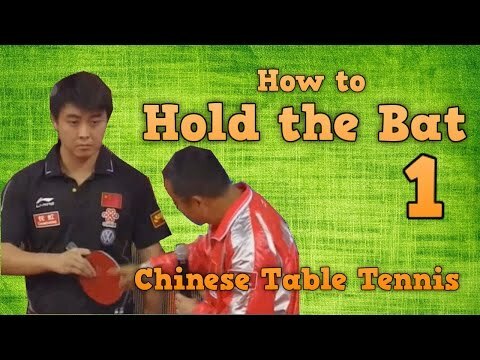 What does a correct table tennis grip look like? “Holding a table tennis bat” is the first table tennis lesson. Having a good grip in table tennis is crucial as it allows you to optimize your technique. Without a correct grip, you cannot do the strokes correctly and never improve to a high level of table tennis. In China, the coach shows the principles of the grip and lets the young kids play with the ball (without the table) at least one week. The kids must feel his racket and adapt his grip properly. This first lesson is very important as the way you hold your bat will stay with you all of your table tennis life. This is Part 1, Liu Guoliang (刘国梁), the head coach of Chinese Table Tennis National Team will explain us the grip of some professional grips: Wang Hao (王皓), Ryu Seung-min (유승민), Ma Lin (马琳), Timo Boll, Zhang Jike (张继科) and Ma Long (马龙). There are 2 main grips in table tennis: penhold grip and shakehand grip. Did you know that there are 6 types of handles and 5 type of grips in table tennis? Part 2, I will explain the most important tips to have a good grip in table tennis. To obtain the best quality of your shots, professional players often slightly change the grip. For the penhold forehand grip, it depends on the stroke. The shots that require the flexibility of the wrist such as forehand serve or the forehand flip on the table. Apply the pressure on the index finger and release the pressure on the thumb finger as shown in the slow-motion video of Ma Lin. When you do the forehand topspin far from the table, which requires a stronger guidance force. Apply the pressure on both the thumb and the index finger to stabilize your stroke and also to add power to your forehand loop. The penhold backhand, as Wang Hao mentioned, the thumb is used to control the angle of the blade and the index is used to help the driving force. You should apply the pressure on the index finger for the penhold backhand grip. Do you like this tutorial? Rate it [ratings]. After you know how to hold your racket correctly, you should read “The best tips and tricks to improve fast your skills in table tennis”. Thank you for your tips.With that,my rating is suprisingly high.Thank you,Emrattich! !